Tired of wearing dentures? Are your teeth so broken-down that you can’t chew your food? 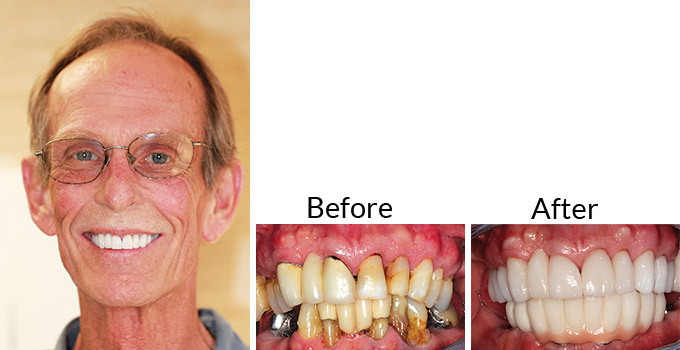 Get new teeth with the All-on-Four procedure, the modern alternative to dentures. Eat what you want and smile with confidence! The most seemingly hopeless smile can be replaced with a stable and healthy one in just one day by using the all-on-four technique. The new teeth feel, look and act very much like natural teeth. 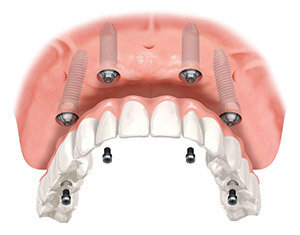 The all-on-four technique takes advantage of available bone by placing four implants in strategic locations and angles. New teeth are attached permanently to the implants. The procedure requires no bone grafting. Even patients suffering severe bone loss as a result of years of missing teeth can receive all-on-four. 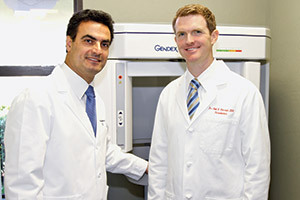 Specialists, Dr. Henriod and Dr. Meserkhani, perform the procedure together. Both are well known for their expertise in dental implants and full-mouth reconstruction. They even teach the all-on-four technique to other dentists. Dr. Henriod places the implants and Dr. Meserkhani designs and places the new teeth. Over the years Drs. 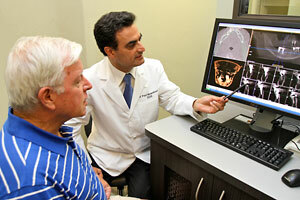 Henriod and Meserkhani have placed thousands of implants and have an impressive 98% success rate. Because of the advanced technology utilized, All-on-Four allows patients with bone loss to avail themselves of dental implants, whereas in the past they were not candidates for such a procedure. Only 4 implants per arch – With All-on-Four, the doctors only need to place four implants in each arch. 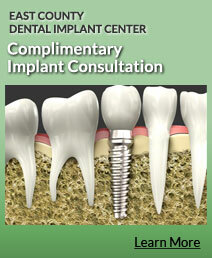 The implants are placed at precise angles to take maximum advantage of existing bone. No need for bone grafting – All-on-Four uses implants that are longer than regular implants and are angled to maximize support. This eliminates the need for bone grafting. Restored chewing power – All-on-Four gives patients 90% to 95% of the chewing capability of real teeth. Preventing bone loss – When teeth are missing, including with the use of conventional dentures, the bone will deteriorate as it is absorbed back into the body. In just the first year after losing a tooth, the jaw will lose 25% of the bone in the area where the tooth was. With the loss of bone mass in the jaws, the lower third of the face will shrink, leading to sagging jowls and wrinkly skin around the mouth. All-on-Four restores your chewing power and keeps the jawbone stimulated, preventing bone loss and facial collapse. Missing teeth and wearing dentures cause a gradual progression of bone loss until the face appears to collapse in on itself. Dr. Henriod or Dr. Meserkhani, will conduct a comprehensive consultation in which they will get the basic information needed to formulate a treatment plan with several options, and to discuss you goals and answer all your questions. Additional diagnostic work, if needed (such as x-rays) will be at normal rate. The first step is a 3D X-ray, which is used to plan the implant placement and to find the areas of densest bone. Using the 3D X-rays, Dr. Henriod plans the surgery ahead of time and creates a surgical guide so that the implants can be placed without any exploratory cutting needed. As a result, post-surgery discomfort is minimal. Dr. Henriod places special long implants at predetermined angles to provide maximum strength and bone coverage. Any needed extractions are done during the same visit. Walk out with new teeth! Dr. Meserkhani takes meticulous measurements to create the final teeth. Patients are fitted with high-grade, fully functioning teeth while the final new teeth are fabricated. These teeth are designed by Dr. Meserkhani to be aesthetic, natural-looking and comfortable, while also providing a strong bite. The new teeth are constructed out of a very lifelike acrylic or a combination of aesthetic porcelain for the top arch and acrylic for the lower arch. Joe had a full-mouth reconstruction, with crowns, bridges and implants on top and the all-on-four procedure on the lower arch. “To: Dr. Vahik Meserkhani, Dr. Joel Henriod and Allen Meserkhani, C.D.T. “I am very grateful for the full-mouth reconstruction you have done for me. Before coming to your dental office, I had lost hope of chewing food, let alone ever smiling again. I am now doing a lot of both. “You are not only the best in your fields, but also true artists in skill and temperament. Thank you from the bottom of my heart for making my life worth living again.